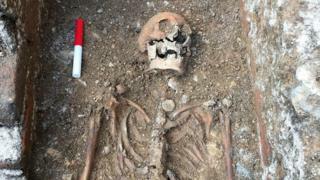 Archaeologists have solved the mystery of the skeleton found in an unknown grave at St Albans Cathedral. The remains were unearthed with three papal bulls, a type of public charter issued by a Pope, during excavation work for a new visitor centre. It has now been determined the grave belongs to Abbot John of Wheathampstead, who died in 1465. Prof Martin Biddle said that finding three papal leaden seals is "a unique discovery in archaeology". The seals were issued by Pope Martin V in the 15th Century to Abbot John, whose burial site had also remained a puzzle for archaeologists until this find. Abbot John travelled to Italy in 1423 and secured the three special privileges at an audience with Pope Martin. The Dean of St Albans, the Very Reverend Dr Jeffrey John, said: "It is a wonderful thing to have found the grave and relics of John of Wheathampstead, one of the most interesting and successful of the Abbots of St Albans. "The papal seals that were found in his grave are a reminder of some of the privileges that he won for his monastery, and of his own national and international influence on the Church at a time when, not unlike today, it was faced with threats of division and decline". Archaeologists have been at the site for three months and have been mainly excavating a lay burial ground dating from 1750 to 1850. But they have also found the remains of a 13th to 14th Century building that would have attached to the transept of the cathedral and which was probably in use up to the 17th or 18th Century. St Albans Cathedral dates from Norman times and is the oldest place of continuous Christian worship in the country. It stands on the site where Britain's first saint, St Alban, a citizen of Roman Verulamium, was martyred by the Romans.